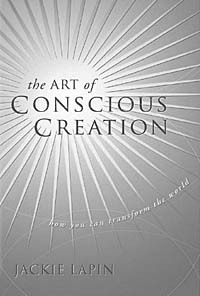 If Yoda got together with Gandhi to write a self-help book, The Art of Conscious Creation: How You Can Transform the World might be the result. A mix of pop-physics jargon, a desire for a satisfied and peaceful world, and an unswerving faith that the universe is more than just the physical stuff that we can see, Jackie Lapin’s new book puts forth the idea that everyone can control their own destinies, simply by modifying their natural frequencies. That begs for an explanation. According to Lapin, human beings are electromagnetic and filled with energy. It makes sense, to a point; the brain is a mass of electrical impulses, each of which can theoretically be measured and quantified. If, as Lapin suggests, each emotion experienced by the brain has its own particular frequency, it should be possible to control the frequencies emitted by your brain by controlling your emotions-theoretically. Of course, that’s a lot easier said than done-which is where the book comes in. Lapin outlines a method for harnessing creative energies to achieve goals through visualization. Ideally, this will allow readers of the book to guide their lives through paths they’ve chosen, while having a positive influence on both their immediate environment and on the world as a whole. This method is put forth mainly through 25 “universal guiding principles,” although the book also contains other content. These guiding principles have interesting-and sometimes amusing-names, such as “‘Tis Greater to Give than Receive, but Receiving Is Pretty Nice, Too!” However, most will be familiar to readers, as they generally restate concepts such as karma, interconnectedness, and gender balance. Overall, the book’s message is simple and straightforward: Focus on what you want, and you’ll get it. If it’s really that easy, bring on the Conscious Creation!